Disney World is on many families’ bucket lists of places to experience with kids, and truly, it is an amazing family fun experience for families! 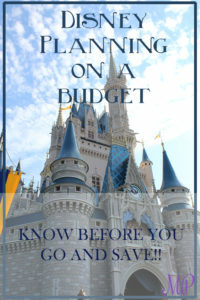 Even if you can’t or won’t spend thousands of dollars on a vacation, you can still experience Disney World with these money saving tips. Plan your trip well in advance. Hotels, while plentiful in Orlando, can book up with the number of visitors and conventions that are ongoing in that city. Planning in advance also makes sense with regards to meal reservations and fast passes. We’ll talk about that more below, but people start booking these up to 6 months in advance, so don’t wait! You also can find out when is the best time to go to Disney. We’ve found that November is a wonderful time- it’s already decorated for Christmas, the weather is very nice, and it’s not that crowded. Once you nail down the dates of your vacation, plan your days in detail. Sound like planning takes away the spontaneous fun, right? Well, time is money in Disney World. One-day ticket prices start at $105/day per person and $99/day per child age 3-9, depending on the Disney park you are visiting and season! The price seems steep, but only until you realize how much you get for your money, with all of the shows, parades, rides, and character visits! But, if you spend your time waiting in line unnecessarily because you didn’t plan well, you will miss out. So, plan your days. Look at the crowd calendars available on touringplans.com and undercover tourist. Decide which days you want to go to which park, based on the crowd levels and what features you’re looking for in your day, whether it be the electric parade which vary in hours at night or the extra magic hours that you can receive by staying at certain hotels. Once you decide your days, plan out your route around the park, keeping your meal reservations, character visits, and fast passes in mind. Doing this in advance will make the day go SO much smoother when you’re in the park with your family! You can book character meals up to 180 days in advance, and they fill up so often you need to check back before your trip to see if better times/days become available. Also, remember if you have a really young one, you can do Rider Swap on certain rides, meaning the parents can switch without waiting in line twice. When planning your hotel and meals, consider a hotel that offers a free continental breakfast in the rate, and remember that you can bring in food and drinks. You can eat breakfast at the hotel, pack PBJ’s, snacks, and waters and take in the stroller, and then eat an off-time dinner in the park, and buy a few fun treats/snacks like ice cream when you really need a break from the day or in the evening. We have stayed at the Hampton Inn near Disney World in Orlando, and enjoyed the free breakfast and free transportation to the Disney parks. Save up to 15% off when you book early at thousands of Hampton by Hilton. Book early & save big! Another option is to stay at a hotel inside the park, making it easily accessible to return back for a midday break, and then you can go back to the park, particularly Magic Kingdom, and enjoy the nighttime parades and fireworks, hopefully avoiding the exhaustion and tantrums! We’ve done this also, and it was awesome, just much more expensive.